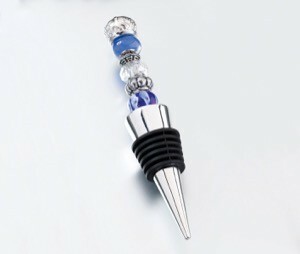 This 4.25 inches silver plated wine bottle stopper makes a great wedding favor. The top of the stopper is decorated with a series of silver beads. If you wish to personalize the stopper with beads of your own, the existing beads can be easily removed. Simply unscrew the end cap of the stopper and slide the beads off the threaded rod. Stoppers are also available in other bead colours: aqua, black, blue, pink or red.